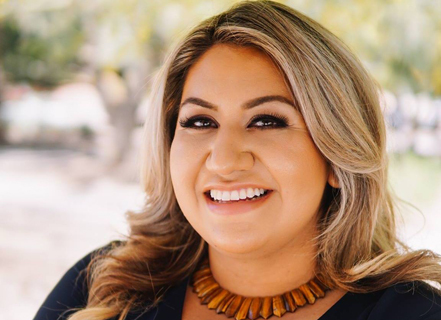 There are two open seats for the Arizona House of Representatives in District 3 and Alma Hernandez will be on the ballot for one of them having won the Democratic primary held on Aug. 28. Alma has been the manager for many political campaigns and she was a delegate for Hillary Clinton. This is her first run for office because she is finally old enough. You must be 25 years old and Alma turned that age this year. “I have been involved in politics since I was 14 years old,” says Alma. “Running for office wasn’t a matter of, ‘Will she be running?’ as ‘When?’ ” She says her parents are overwhelmed to have all three kids running at the same time. 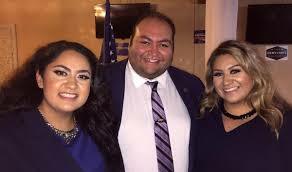 Alma’s sister, Consuelo, is running for the Sunnyside School District Governing Board in Tucson and her brother, Daniel, is running for re-election for Legislative District 2. Consuelo, Daniel and Alma Hernandez. Alma chose to run for this position because a state representative influences what happens in Arizona – from deciding laws to dealing with the state budget. “I knew we were going to have two open seats in this election, so I said, ‘Why should I wait,’ I have no reason to wait or to recruit people from outside our district to run,” she says. “I was born and raised here and I have been helping everyone who has been elected for many years.” She had also just completed her Master of Public Health at the University of Arizona, so she figured it was a good time. Alma received national attention when former KKK leader, David Duke, tweeted a derogatory comment about her at the end of June. She believes that he thought she was an easy target. She did not respond to Duke, but the Arizona Anti-Defamation League did. She faces a quadruple set of challenges being in the political arena: she’s young, a woman, Hispanic and Jewish. Her mother’s grandfather was Jewish, and it’s the religion she has always felt a connection to. Alma converted in 2015 and celebrated her bat mitzvah in 2017. “It was a big party, that’s a big deal in our family – to have big celebrations for the milestones we meet. I am very happy that I did all of it,” she says. 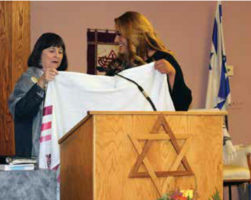 Alma at her naming ceremony with Rabbi Stephanie Aaron of Congregation Chaverim. 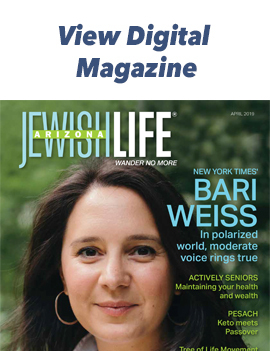 Alma worked at the Jewish Federation of Southern Arizona as the Jewish Community Relations Council coordinator before leaving to run for office. She has been involved with AIPAC and the Jewish Latino Teen Coalition since high school. She also worked at Hebrew High on a program called “Tracing Roots” where teens work with the elderly. It was through Hebrew High that she met attorney Tony Zinman, his son was one of her students. “(Tony and I) talked and agreed we needed to do something on the issues relating to gun violence, health care and more,” says Alma. As a result of this meeting, Tucson Jews for Justice was founded. The purpose of the group is to work on domestic issues that are affecting the community locally. 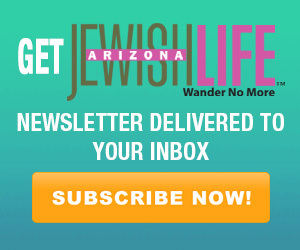 When the influx of immigrants trying to seek asylum reached the border this summer, Tucson Jews for Justice organized a call to action. “My mother is from Nogales, Sonora, Mexico, and all of her sisters were calling and letting us know that these families really needed help,” says Alma. They ended up driving more than five vehicles loaded with supplies of food, hygiene products and basic living necessities to Nogales. “I come looking at these situations from a very different perspective form most people,” explains Alma. “Because I worked on immigration issues and my mother is an immigrant from Mexico, I feel a connection and bond to these issues. It goes back to who I am and who most of us are as people.” She tries very hard to be diplomatic and work with people whether they agree with her or not. For more information on Alma’s campaign, visit almaforarizona.org. Her grandfather was a Jew, not her grandmother or mother. I think she is a convert to the religion. I’m a Jew because my mother is and grandmother is etc. You are correct, Norma. In the article it mentions that Alma converted in 2015.